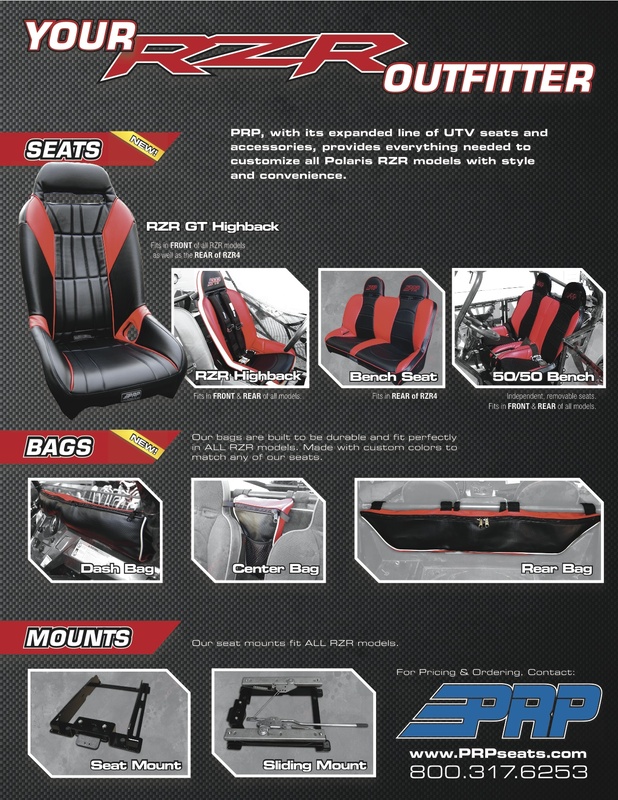 PRP Seats now has a full line of accessories available to outfit your Polaris RZR. It doesn’t matter whether you own a RZR, RZR-S, XP, or the RZR4. PRP has something for your vehicle to increase the style and convenience. PRP’s line of accessories includes seats, harnesses, mounts, and bags. 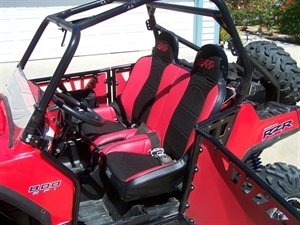 If you’re looking for the ultimate in seating comfort, PRP has four different seats available to fit the RZR. The RZR GT Highback, which includes large slots for easy seat belt removal and also a slot to reach the rear seat latch, offers the utmost in style and convenience. The rear Bench seat offered by PRP allows you to optimize the amount of room in the back of your RZR4 so you can include all the kids on the next ride. The 50/50 Front Bench seat is the best of both worlds and allows you to have the containment of a suspension seat while still having the shoulder room you need. The 50/50 Bench is also much easier to install and remove then other bench seats on the market. One person can easily do the job. Last but not least is the RZR Highback, this seat is the one that started it all! This is your traditional suspension style seat that includes slots for harnesses and a great containment with the side bolsters keeping you planted in the car. All of our seating options provide more occupant room than any of the competitor’s suspension seats. To keep your seats in the car, PRP has developed a line of seat mounts that allow you to replace the factory bases and have a steel mount that won’t break. PRP can also include a sliding seat mount if you need to be a little closer to the peddles and wheel. If you’re like us and like to take more stuff with you than there is room for, take a look at the storage bags that PRP has available. 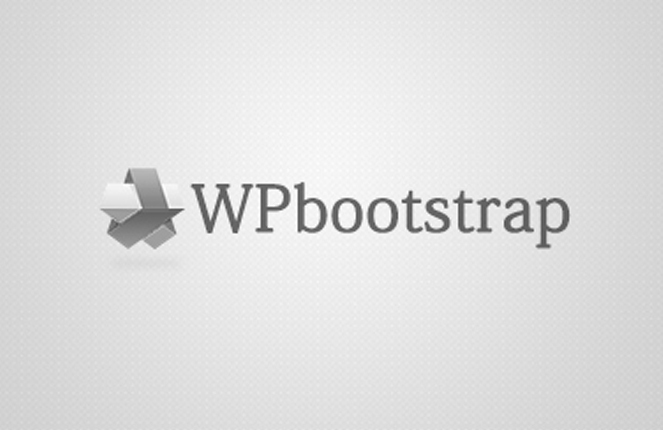 With three different options you’re sure not to have to leave anything at home again.